This economy priced circularly polarized 5.8GHz antenna system is for 5.8GHz wireless FPV video systems. 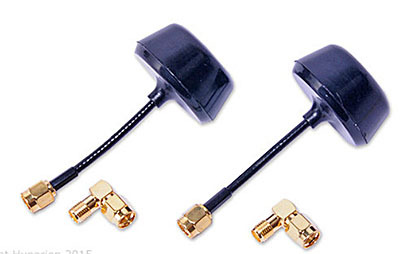 It's a two antenna set for budget sensitive FPV hobby applications. It includes two Skew-Planar Wheel type aerials (one 3-lobe for FPV transmitter and one 4-lobe for receiver). Omni-directional Right Hand Circular Polarized (RHCP) with SMA connectors. Includes two right angle adapters. Because these antennas are Right Hand Circular Polarized (RHCP) designs, they should only be used with other RHCP antennas. Do NOT use it with standard linear polarized antennas. Keep in mind these are "budget" priced antennas. If you require high performance then we recommend our BlueBeam Ultra antennas. 5725 ~ 5875 MHz frequenct range. Flexible 2-inch long coax cable. SMA connectors with removable right angle adapters. "Tx" labeled antenna is 3-Lobe for Transmitter. "Rx" labeled antenna is 4-Lobe for Receiver. Small size, radome only 1.4 x 0.72 inches (35 x 18 mm). Two identical antennas are provided (for transmitter and receiver). Produced by Hyperion, #HP-FPCLVLF58SETS. Made in China. Special Price: Available while supplies last. Our price: $10.99 Item In Stock! 5.8GHz Omni Antenna Set, RHCP (Hyperion) was successfuly added to your shopping cart. You can browse for more products or proceed to checkout.